Leave the car behind and walk to the FOOTBRIDGE beach! Off Season Weeks available! Sleeps 6! Walk to Perkin`s Cove - Adorable! Cape style beauty near in the much desired Footbridge Beach vicinity. Two bedrooms up: master bedroom has 1 Queen sized bed, the other offers 2 double beds. Downstairs the den offers a full sized pull out bed. Nicely appointed for your vacation! 3 A/C - window units, washer, dryer, TV & DVD, dishwasher! Donna was very gracious, and always very helpful! We always enjoy our stay at 43 Seaview. 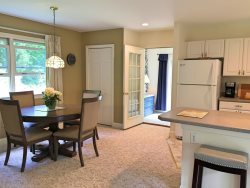 It's a great location, quiet but near everything the Ogunquit/Wells/Kennebunkport area has to offer. The view overlooking a segment of the Rachel Carson National Wildlife Refuge and the Ogunquit River is wonderful, and so peaceful! Love watching the birds (and paddle boarders)! NOTE: The "Total Price" in the instant Quote box includes your REFUNDABLE security deposit ranging from $300 to $500, as well as the 9% Maine State Lodging Tax.